Ready for winter? Time for all weather Traction Pro traction control! Snow is in the forecast for next week and you know what that means - time to put the chains back in the car and get ready for winter driving conditions. Living at the foot of the Sierra, we know that snow and bad weather are possible any time after the end of September. We know that it's time to keep the car stocked with blankets, water and something to keep you from getting stuck in the mud or snow. Like EP Minerals' Traction Pro! It's going to be a staple in the trunk of my car this winter. Traction Pro is an all weather, all season, traction product with no added chemicals, designed to provide instant traction in mud, snow and ice. It's a unique 100% calcined clay formula that provides a sandpaper-like traction grip when applied to roads or slippery surfaces, so it dramatically improves driving and walking conditions. 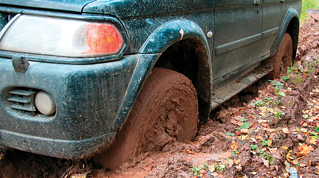 Sounds like Traction Pro is the handy product to keep in your car or truck, around the house, and at the office to use in any kind of bad weather that produces slick conditions. Traction Pro helps prevent “slip and falls”. I know we'll keep several bags around our office for those shady spots that keep freezing and the back stairway this winter. Its natural brick red color makes it easily visible on ice and snow, without any additives or dyes. To learn more about Traction Pro, click here or contact you local sales representative. Bring it on, Mr. Winter! But not for a little bit yet. I'm still enjoying our 70 degree day!